Sugar is sweet and sweetness is one of our five basic tastes. Most of us love the taste of sugar, which makes sense, as our brain loves sugar too, and rewards sugar intake by flooding the body with the feel-good chemicals dopamine and serotonin. This deluge of happy hormones in turn creates a rewarding effect, linking sugary foods with feelings of happiness and general contentment. In fact, our early ancestors were hard-wired to seek out sugar. This adaptive behaviour was driven by its rarity and the need for food and energy for survival. Fast forward to 2019 with an abundance of sugary food products filling the shelves of most supermarkets. Sugar is today considered public enemy number one when it comes to our increasing number of health conditions. The question is… should we cut it out all together? There are essentially two types of sugar found in food and drinks: 1. Added sugar – this is the refined sugar that is added to processed and packaged food 2. Naturally occurring sugar – this is the sugar that is found naturally in whole foods Most of the sugar we consume is refined sugar, added to processed or pre-made foods and beverages. Whilst there are some benefits to sugar such as adding flavour, changing texture and providing us with energy, foods with added sugar usually have very little to no vitamins and minerals (including iron, potassium, calcium and fibre). They are also often combined with excess trans or saturated fats. Having too much of this type of sugar may lead to more health problems. Fruits, vegetables, whole grains and milk all naturally contain sugars. These natural sugars come with many other nutrients, including fibre, which can help to slow down its absorption into our blood stream. It also gives us energy and does not seem to harm our health. 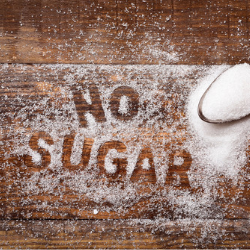 FACT: Both added sugar and naturally occurring sugar have the same number of calories or kilojoules. If you have too much, both can lead to weight gain. What are the risks with having too much sugar? An increase in the cholesterol (blood fat) produced in the body. This means that more fat can build up in the walls of our blood vessels, increasing the risk of heart disease. Ups and downs in our blood sugar levels which increases the chances for problems in our kidneys, eyes and heart. Cavities! Children who eat sweet snacks more than 5 times per day have more cavities and missing teeth than children who don’t. Should you cut out all sugar? Cutting refined sugar out of our diets completely certainly won’t hurt, but it focuses our attention on a single nutrient, just like the low-fat diet obsession of the last thirty years. A healthier approach may be to simply reduce the amount of added sugars you eat and drink. On average Australian’s eat and drink the equivalent of approximately 27 teaspoons of total sugars (including refined and natural sugars) per day (108g). The World Health Organisation (WHO) recommends approximately 6 teaspoons of sugar per day for adults of average weight, or roughly a 5% daily intake. When it comes to fruit, it is recommended that most people have two servings of fruit per day, such as an apple and a banana, or an orange and 2 small plums, or 1 cup of fruit salad and a pear. Read food labels carefully. To find out if a food has added sugars, check the ingredients list for sugar, syrup, honey, or ingredients that end in the letters “ose” (such as “sucrose”, “fructose” or “Maltose”). If a tub of yoghurt has 16g of sugar, then that is about 4 teaspoons of sugar or two-thirds of your daily allowance. Avoid beverages with added sugar. Water is always a great alternative choice. You may also enjoy no-sugar or low-sugar beverages, like unsweetened iced tea. Choose naturally sweet options. To satisfy your sweet tooth whilst avoiding extra sugar and calories, choose fresh fruit for a snack or dessert. Try grilled pineapple slices, a baked apple, frozen berries or frozen grapes. Sometimes you just want to eat something sweet—and that’s okay. Try to maximize flavour by watching your portion sizes of desserts and make choices that are satisfying in small amounts. For example, dark chocolate has a stronger flavour and more nutritional value than milk chocolate, so you can satisfy your sweet tooth and get some nutritional benefits, even with a small portion. Plan your meals and snacks. Eating regular meals and snacks can help you feel satisfied throughout the day. A balanced meal plan can also help keep you from being tempted by less healthy foods. Do you need help making healthy food choices? MyCoach for Nutrition offers you free, confidential support from an Accredited Practising Dietician. Whether you’re seeking support for sustainable weight loss, managing food intolerances, allergies and medical conditions, we’re here to help. MyCoach can also provide guidance on how to achieve a healthier lifestyle for you and your family. Contact us today by calling 1300 360 364, or by logging in to BeneHub for tools and resources to be your best you.